Perú is characterized by more than a dozen rivers that are more than 600 kilometers long; the longer rivers where the cisco fish are inhabited find themselves with a total length of 7,000 kilometers within the country of Perú. 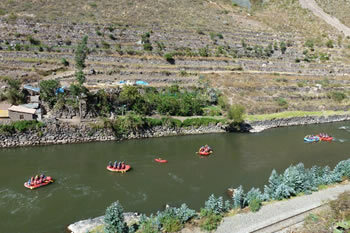 Within all these rivers, the Vilcanota River can be found – located at 1.5 hours from the city of Cusco; it was found to be sacred by the Inkas, who called the river “Wilkamayu” due to the fact that it was born in the knot of the Vilcanota mountain range between Cusco and Puno, reaching the province of Urubamba and passing through a large canyon that, in its descent, irrigates the Sacred Valley of Pisac, Calca, Urubamba, Ollantaytambo, Machupicchu, ending in the Amazon. 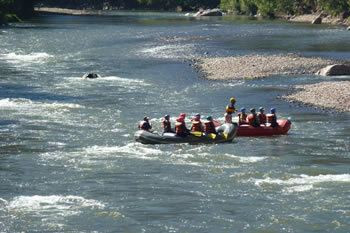 Rafting through the Vilcanota River is a free air watersport that offers sportsters the most maximum adrenaline that one can imagine; furthermore, the river provides incredible passages with a diversity of ecosystems. 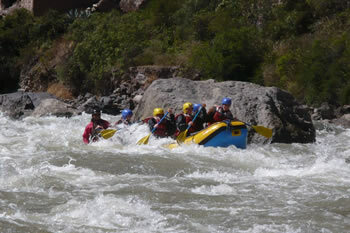 The river at the farthest length offers different sections with differing levels of rapids; Class 1, Class 2, and Class 3 are easy to conquer with little risk, can be realized without previous experience, and are participated in during the dry season – however, Classes 4 and 5 are a challenge and are participated in during the rainy season. The adventure allows everyone to enjoy different aerials and levels. 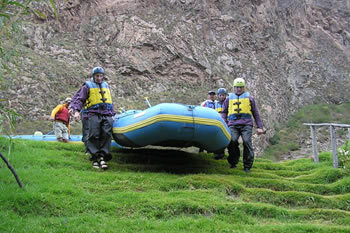 We recommend coming to experience the most exciting and the best rafting in Perú via the Vilcanota River. Note: The best time to participate is during the months between May and November. 09:00 AM – We will personally pick you up from your hotel in Ollantaytambo in order to take touristic transport towards the community of Pachar (Urubamba), passing through some beautiful passages along the way. 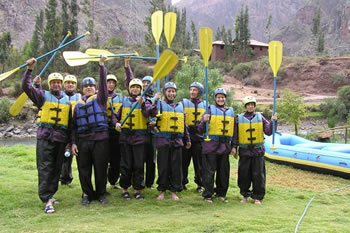 Upon arrival to the Vilcanota River – and before the start of our rafting experience – our guide will give us instructions on security and also on how to use the equipment; we will then embark on the 2-hour adventure, rafting through Class 2 and Class 3 rapids depending on the route and the weather season. 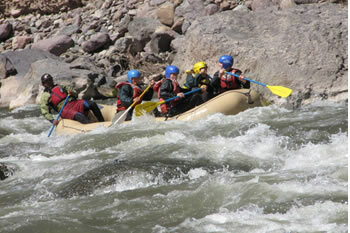 Included: Private transport, professional rafting tour guide, helmets, rowing helmets, boxed lunch + hot drinks. WHAT YOU SHOULD BRING WITH YOU: Complete Set of Dry Clothing; Sandals; Shoes; Personal Belongings (Towels, Warm Hats, Sunglasses, Sun Block); Swimming Trunks and/or Bathing Suits; Shorts; and, Warm Clothing (For After Getting Out of the River).